In the recent lists posted here of vacant Stateside sees, observant readers have been quick to note that the tallies have failed to include the Syriac Catholic diocese for the US and Canada, Our Lady of Deliverance of Newark. Founded in 1995, the 60,000-member Eastern church on these shores fell open following last month's election of its eparch (bishop), Joseph Younan, to the patriarchate of the Syriac church, based in Beirut. 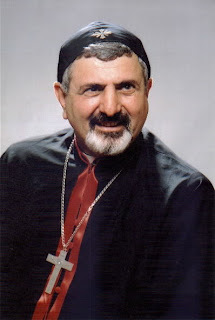 Now known as Ignace Joseph III, the 64 year old's fellow hierarchs elected Younan the 136th patriarch of Antioch at a January synod in Rome, following which Pope Benedict quickly granted the requisite ecclesial communion each Eastern patriarch must seek from the Roman pontiff following his election. Immediately following his enthronement, Patriarch Younan blessed the faithful as he was lifted three times in his chair. "Blessings ... long life," the faithful chanted in Arabic. Women in the choir ululated amid the cheers and applause. Patriarch Younan said, "It is a great honor I don't deserve, but I put my whole trust in the one who said, 'You have not chosen me; I have chosen you.'" Thanking those "who had traveled a great distance," the new patriarch praised "my dear friend," Cardinal Theodore E. McCarrick, retired archbishop of Washington, "who truly was my father in the faith since my very beginning as a missionary priest then as bishop in the United States." Cardinal McCarrick, speaking in French, said Patriarch Younan was like a little brother "who I am proud to consider as my spiritual friend." On the altar, Cardinal McCarrick sat alongside Cardinal Nasrallah P. Sfeir, patriarch of the Maronite Catholic Church. Drawing cheers from the estimated 150 people who came from Syria -- some from Patriarch Younan's home village, Hassake -- the patriarch noted he "was born in Syria, where my parents found refuge after fleeing" Turkey. A delegation of 35 people came from Istanbul, Turkey. Some 70 people came from Iraq, and numerous Iraqi flags were visible throughout the church. Father ST Sutton, who served as secretary to Patriarch Younan while he was a bishop in the U.S., said the new patriarch is "very intelligent, very collegial and open-minded. And he has a great sense of humor." "He is a prayerful man. The ultimate climax of his prayer life is the Eucharist," the priest said. Father Sutton said Patriarch Younan has a keen sense of the universality of the church. "If anything, he is a bridge-builder and a healer. He has no personal agenda except to unite and serve the Lord," said Father Sutton. The priest said the patriarch's departure from the United States is "bittersweet" and that the faithful are awaiting a new bishop, scheduled to be selected during the July synod. Beyond North Jersey's Syriac see, six Latin-rite churches on these shores await a new head, led by Mississippi's Katrina-hit diocese of Biloxi, vacated last April.